NEW ORLEANS — And then there were three. 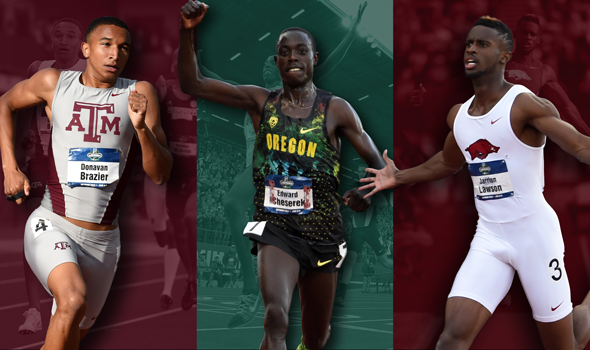 After careful deliberation, The Bowerman Advisory Board whittled the 10-man list of semifinalists for The Bowerman Award down to a trio of talented student-athletes that stood out throughout the 2016 collegiate track & field season. Texas A&M’s Donavan Brazier, Oregon’s Edward Cheserek and Arkansas’ Jarrion Lawson were named finalists for The Bowerman Award on Friday. Cheserek becomes the first three-time finalist in the history of the award (2014, 2015 and 2016), while Brazier and Lawson get their first — and only — crack at the 35-pound trophy (Brazier decided to pursue a professional career after the conclusion of the outdoor season and Lawson exhausted his eligibility). This also continues a trend of the Pac-12 and SEC — the two dominant conferences in collegiate track & field — jostling for the sport’s biggest honor. Going back to 2014, this is the third time in as many years that the Pac-12 and SEC each has at least one finalist and the second time in three tries the conferences own the entire finalist pool (2014). Brazier had an incredible freshman year and is looking to become the Aggies’ second male winner of The Bowerman Award (Deon Lendore in 2014). The Grand Rapids, Michigan native burst on the scene during January’s Aggie 11-Team Invitational in only his second collegiate meet. Brazier scorched the track over 800 meters on his way to the fifth fastest time in collegiate history indoors (1:45.93) and broke a 34-year-old American junior record. An injury forced him to drop out of the semifinals of the NCAA Division I Indoor Track & Field Championships, but he made up for lost time — and then some — when the best of the best met outdoors at Hayward Field. Brazier shattered Jim Ryun’s 50-year-old collegiate record on its anniversary and ran 1:43.55 to edge Brandon McBride, who ran the third fastest time in collegiate history. Cheserek continued to prove there are very few men like him when it comes to racing on the big stage of NCAAs. Between indoors and outdoors, the Oregon junior captured four individual titles and anchored a championship distance medley relay team. What Cheserek did in Birmingham, Alabama in mid-March was nothing short of remarkable. Less than 30 minutes after winning the 5000-meter title, Cheserek doubled back to notch a come-from-behind victory for the Ducks in the DMR against the fastest all-conditions miler in collegiate history (Washington’s Izaic Yorks). Cheserek polished off the triple (3000-5000-DMR) the following afternoon. Then on his home track in Eugene, Cheserek became the first man since Galen Rupp to sweep the indoor and outdoor slate clean. Cheserek, who battled nagging injuries during the regular season and lost two races, bounced back at NCAAs and won the 5000- and 10000-meter crowns over the span of three days. Last, but not least, there’s Lawson. During a pre-meet press conference in Eugene, a rival of Lawson said the Arkansas senior could put his name alongside the legendary Jesse Owens thanks to his upcoming workload. Lawson was scheduled to compete in four events across those two days — the 100, 200, long jump and as a member of the Razorbacks’ 4×100 relay team. Lawson made true on that statement when he became the first man since Owens in 1936 to sweep the 100, 200 and long jump titles at the same NCAA meet. His long jump title came first, followed by the 100 and when it came down to the 200, Lawson made sure there was no doubt whom the star of the championships would be as he edged Christian Coleman — the indoor champ — by seven-tenths of a second. All told, Lawson tallied 31.5 points by himself and broke the modern-day scoring record at the NCAA Outdoor Championship. Throw in his 14 points from indoors (long jump champ, 5th at 60 meters) and that’s not a bad haul at all. So will Brazier or Lawson give the SEC its third consecutive The Bowerman Award or will Cheserek bring one back to the Pacific Northwest for the first time since 2010? That question will be answered in December at the annual USTFCCCA Convention when Brazier, Cheserek and Lawson join the women’s finalists for a live-streamed awards show at the JW Marriott Orlando Great Lakes Resort and Spa. Finalists were chosen by The Bowerman Advisory Board, an 11-person panel of track & field experts from around the country, based on performances recorded during the 2015-16 indoor and outdoor track & field seasons. Only performances through the conclusion of the NCAA Outdoor Track & Field Championships are eligible for consideration. The Bowerman Voters will receive ballots listing each of the finalists and must rank them by first, second and third choice. First-place votes will receive three points, second place will notch two, and third will receive one point. The finalist with the highest point total will be declared the winner. The Bowerman, which debuted in 2009, is presented annually by the USTFCCCA to the most outstanding male and female collegiate track & field athletes in the nation. Oregon’s Jenna Prandini and Florida’s Marquis Dendy are the reigning winners of The Bowerman, which is named for legendary Oregon track & field and cross country coach Bill Bowerman. Past winners include Olympic gold medalist, four-time World Champion and decathlon world-record holder Ashton Eaton (2010), 10,000-meter Olympic silver medalist Galen Rupp (2009), 2011 IAAF World Champion at 1500 meters Jenny Simpson (2009), 2013 100-meter hurdles World Champion Brianna Rollins (2013) as well as 2012 Olympic high jump bronze medalist and 2015 World Champion Derek Drouin (2013). Bowerman served the sport of track and field in numerous ways. His leadership in the USTFCCCA’s predecessor organization, the National Collegiate Track Coaches Association, and his contributions to NCAA track and field and the running community as a whole are among his many lasting legacies. For more information on The Bowerman, the award, the trophy and Bill Bowerman himself, visit TheBowerman.org. The U.S. Track & Field and Cross Country Coaches Association (USTFCCCA) is a non-profit professional organization representing cross country and track & field coaches of all levels. The organization represents over 9,000 coaching members encompassing 94% of all NCAA track & field programs (DI, DII, and DIII) and includes members representing the NAIA, NJCAA as well as a number of state high school coaches associations. The USTFCCCA serves as an advocate for cross country and track & field coaches, providing a leadership structure to assist the needs of a diverse membership, serving as a lobbyist for coaches’ interests, and working as a liaison between the various stakeholders in the sports of cross country and track & field.